Local musicians are creating waves beyond the city borders, and here’s a list of few you should look out for. No matter what your taste in music is, you can find some tunes from these incredible groups that you will enjoy, and perhaps even cherish. Threeory is an experimental fusion band comprising of five members. Syntyche Mongro (vocals), Mark Talur (keys), Senti Along (guitars), Parsa Dattasai (violin), and Tarun Vishal (drums) who blend Indian classical with different kinds of world music. Playing at popular locations around the city, from Nirvana Bistro and Air Live to massive events like New Year parties and Sunday Soul Sante, watch this band that transports you to a different planet altogether. 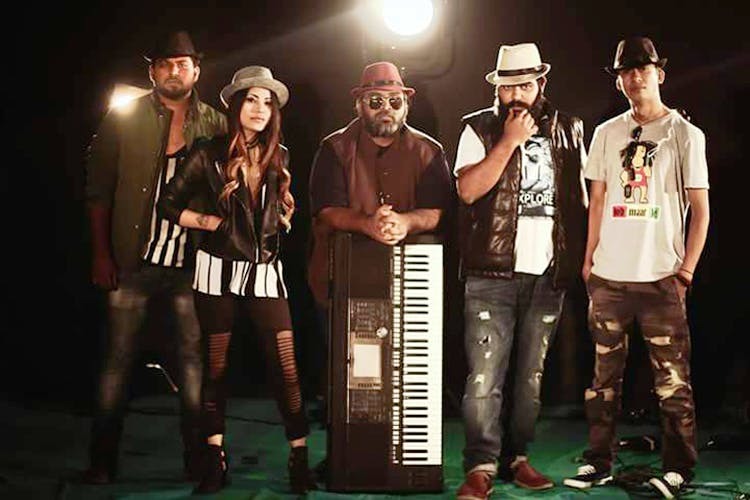 Capricio — is a classical fusion band that's taking Telugu music to places. Ever since we watched their first video on YouTube, we've been fans and watching them perform at places like The Moonshine Project, Tabula Rasa, #788 Avenue is nothing short of a brilliant experience. If you haven't watched them perform yet, we urge you to look up their next performance and go! Although The Ragamuffins began in 2015 as a 4 piece semi-acoustic band, it was in the following year that Pranati Khanna (lead vocals) brought about game-changing improvisations. Today, the indie-rock group consists of Alex Varghese (drums and backing vocals), Jonathan Edward (lead guitar, backing vocals), Ricky Raymond (lead guitar), Sanju Moses (base guitar) and Pranati Khanna. If you haven’t already, listen to their debut EP — Tell Me (and buy it too!) The tracks encourage people to speak up about issues that matter to them. Their lyrics make striking statements on important topics like war and greed. Every single piece is extremely relevant to the society today, so this is a band you don’t wanna miss lending your ears to. Also, check out their music video (named Best Damn Memory) or catch them live while they tour around the country. The Songsmiths, represents the trio — Saikat Basu (bass and vocals), Avinash Ekka (guitars), and Karthik Kalyan (drums). Each member of this band takes a particular interest in different genres, ranging from Jazz, RnB, Electronica to Folk Music. What happens when these differences come together in the form of one of their original songs is a brilliant ‘easy listening’ experience for the listeners (If you’re a rookie, or a musician yourself, you will surely enjoy their stuff). Check out their song about the cityscape in wee hours of the night or hunt down their feature on Kappa TV. We’re definitely looking forward to more of their original compositions and gearing up for some crazy live-performances this year. Formed in 2015, The Playmores comprises Rinky (lead vocals & guitar), Chaitanya (keyboards), Sai (drums), and Ananth (bass guitar). Each band member comes from a drastically different musical background and together they create a sound that sets them apart from the rest. They take songs from all genres of music ranging from classic rock and grunge, to contemporary pop and transform them, making versions of their own. With an intent to take familiar songs and add their own creativity to it, they give electric live performances that will blow your mind. Have you checked out their amazing cover of Sayonee yet? Catch them live at popular hangout spots in the city. Didn’t include your favourite band? Tell us in comments!